I can’t lie, The Blot is always surprised we don’t see more movie poster screen prints for Paul Verhoeven’s 1990 sci-fi classic Total Recall starring Arnold Schwarzenegger! I mean who doesn’t love that film? Thankfully Vice Press and Bottleneck Gallery do, as they’ve teamed up with British artist Karl Fitzgerald to release this officially licensed Total Recall poster! 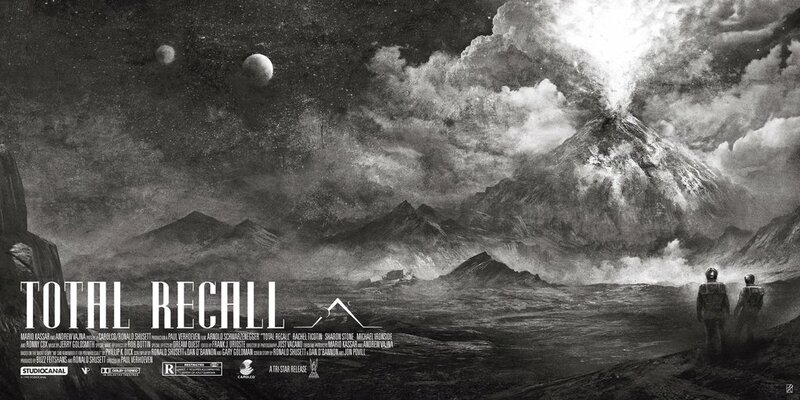 Produced under license from Studiocanal, Total Recall by Karl Fitzgerald is a 36”x18” screen print. The Regular Edition has a run size of 200 pieces and will retail for $40 (£30), while the Variant is limited to 100 pieces and will retail for $50 (£40). Both editions go on sale at 12pm EST today, Friday, January 6th, simultaneously at the Vice Press online store and the Bottleneck Gallery online store.